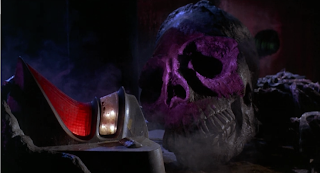 Today, Mario Bava's 1965 sci-fi/horror blend Planet of the Vampires. 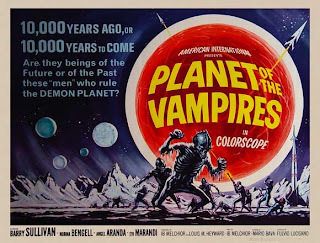 The IMDb trivia says that fifteen different titles were considered for this movie before Planet of the Vampires was settled on. It's an odd choice, having the title promise an entire planet of vampires, when it doesn't actually feature any vampires at all. Alternate titles include Planet of Blood, The Haunted Planet, The Planet of Terror, and The Planet of the Damned, all of which are more fitting, while its title in Spain is simply and appropriately Terror in Space. The planet of the title is Aura, a world so thickly enshrouded in fog that some don't think there's even any land to it, betting that it's merely a cosmic cloud. 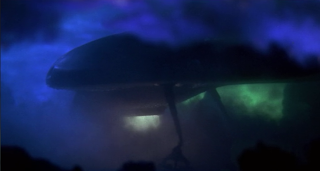 But beneath the fog it is a proper planet, and when spaceship Argos and its sister ship Galliott pick up a signal emanating from Aura, they decide they have to land there to check and see whether this signal is a natural emission or a manmade transmission sent by someone in distress. As the ships prepare to land they lose contact with each other, equipment short circuits, the automatic controls go haywire and the forced manual landings are rough ones. Once on the surface of the mysterious planet, the Argos crew members begin to behave strangely, some violently attacking each other, others driven to go outside without helmets or to sabotage equipment. The crew is able to regain their senses, after which they have no memory of the uncharacteristic things they were just doing. The Galliott crew were not so lucky, they didn't snap out of their violent trances. When Argos crew members traverse the rocky, barren Aura landscape to check on their nearby sister ship, they find that everyone on board the Galliott is dead. Soon after the bodies are discovered, the dead rise, their minds still controlled by whatever force caused their fatal impulses. Surrounded by danger, the crew of Argos scrambles to get their controls fixed so they can escape from Aura before they too join the ranks of the alien-mind-controlled dead. But they're not the only ones who want to escape Aura. Planet of the Vampires is often referred to as a sort of precursor to Ridley Scott's Alien, given that it deals with a spaceship landing on a strange planet in response to a signal of unknown origin, which turns out to be a deadly mistake for its crew. A sequence in which the Argos Captain and a cohort explore an ancient structure on Aura and find the remains of long dead, massive creatures has been cited as a clear inspiration for Alien's Space Jockey expedition, but Ridley Scott and Alien's writers denied having seen Planet of the Vampires before making their film. POTV's greatest asset is the style director Mario Bava and his cinematographers bring to the visuals, the use of shadows and light, light that is usually shining through a colorful gel. The foggy locations of Aura are lit with a mixture of green, purple, red, yellow, and blue, and it looks awesome. Also impressive, and these days charming, are the film's effects. There were no opticals added, all of the effects were done on set and in camera, using mirror trickery, forced perspectives and models. An AIP/Italian/Spanish co-production, the film also had an international cast, all of whom spoke their native languages on the set, their voices to be dubbed later, as was the case with most Italian movies. The script was the work of Bava and four Italian and Spanish co-writers, an adaptation of Renato Pestriniero's story entitled One Night of 21 Hours. AIP's Louis M. Heyward and writer Ib Melchior did another pass on the script for the American version. Melchior's filmography was largely made up of genre titles, a list that includes Reptilicus, Journey to the Seventh Planet, The Angry Red Planet, Robinson Crusoe on Mars, and the source material for Death Race 2000. Planet of the Vampires is an enjoyable sci-fi/horror mix. I find that it drags a bit at times, but the overall story is interesting and the cinematography is always wonderful to look at.